The Acorn Woodpecker is mostly black, with a white rump, belly, and white encircling the face, red crown, and white irises. Males have more extensive red on the head. Sexes similar, although females have less red on the head. Similar to adults but less glossy. Acorn Woodpeckers glean insects from tree branches or catch them in the air. They also harvest acorns and store them in holes drilled in the trunks of trees. Acorn Woodpeckers occur in parts of the western and southwestern U.S.
Visit the Bent Life History for extensive additional information on the Acorn Woodpecker. 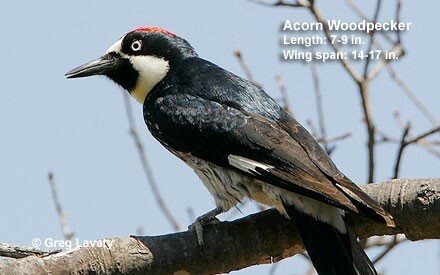 The Acorn Woodpecker lives in colonies, and several adults may help incubate the eggs in a single nest. So-called granary trees in which acorns are stored for later use may contain tens of thousands of acorns. The call is a "waka-waka-waka." Acorn Woodpeckers will take nectar, and occasionally come to hummingbird feeders. Will also feed on suet and peanuts. The White-headed Woodpecker has a white face and chin. Top of head mostly white. Ranges overlap in northern California. The male Williamson's Sapsucker has a dark crown, red throat, yellow belly and large white wing patch. Ranges overlap in New Mexico and Arizona. The Acorn Woodpecker's nest is in a tree cavity. - Young hatch at about 11-14 days. - Young fledge (leave the nest) at about 30-32 days, but associate with the adults for some time.